Fast car, heavy weapons and angry KGB agents around you - is all you need to feel yourself the Real Hunter on Wheels and have the greatest fun in you life.Your carrier includes fifteen secret missions. Save the world from KGB threat, fight with crowds of deadly armed agents, number of mini-bosses and KGB General aka Big Boss on roads of Europe, USSR, in deserts of Caucasus, and snows of Siberia and Alaska. These roads full of civilians, money, weapons and KGB agents. You must be brave and fast. 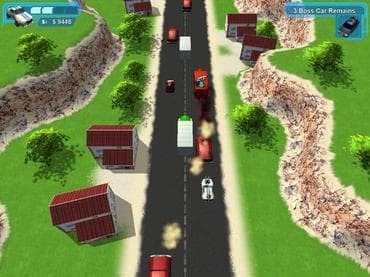 Download this free full version game and start your race with KGB! Free Game Features: - 15 secret missions; - Amazing graphics and soundtrack; - Deadly armed enemies and bosses; - Unique power-ups; - Save / Load game option; - Game statistics; - Free full version game without any limitations. If you have questions about KGB Hunter game, please contact us using this form.